The Spring Break menu is running a little late this week because we have been busy enjoying the outdoors with the kiddos! However, we will be up and baking this coming Saturday and have a lot of yummy treats headed to the Imperial Farmers Market from 9-1. It should be a beautiful weekend so come out and see us or place your orders for neighborhood pickup! We will be watching the weather forecast but if all goes well we will be at the Imperial Farmers Market this Saturday from 9-1! Posted below is the menu for the week. Feel free to message ahead of time with your orders and we will have them boxed and ready for you- either for pickup in the neighborhood or at the market. If for some reason we get rained out- we will post and let you know! Rain, rain, go away! Last weekend, with the 100'% chance of thunderstorms, we opted out of a potential washout at the markets. 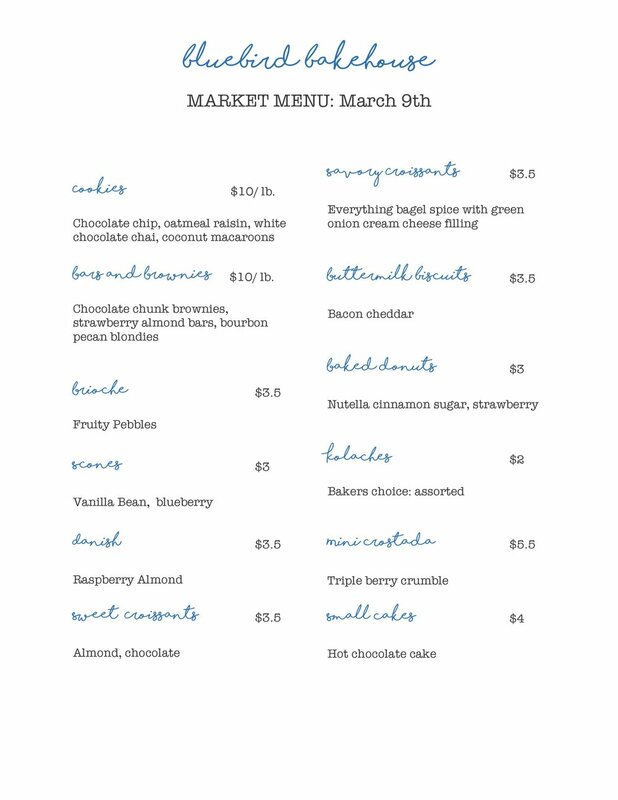 But we are back this weekend and with a really fun menu! You can check it out below. As always, you are welcome to send us a message ahead of time with your order and we will have your goods boxed and ready for pickup in the neighborhood or at the market. Happy Valentine’s Day! We will be celebrating at the market this weekend and filling orders for neighborhood pickup. Come out and see us or give us a shout with your order. Thank you all for your continued patronage of my little bakery! I have been taking a break from the farmers markets but I am still baking up a storm for private events and special orders. 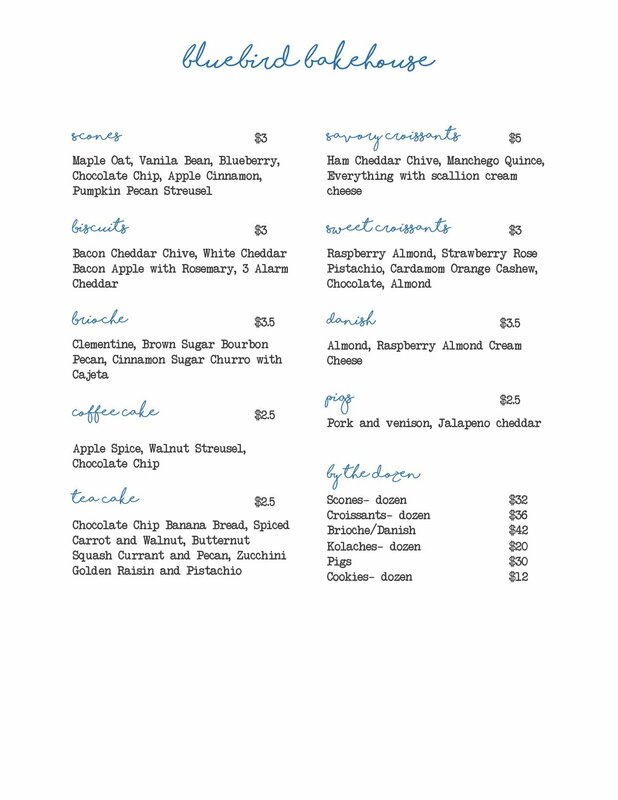 I have updated my menu and will continue to feature seasonal items but current prices, items and flavors are listed under my menu tab. If there is anything that I can do to help you celebrate your next special occasion please let me know! I'll get your order on the books and get to baking! Now that we have Halloween properly celebrated and October is officially checked off the yearly calendar, what better way to officially get the holiday season started but with an exciting new menu! Below you will find the Bakehouse offerings this year for both Thanksgiving and Christmas. If there is something that you are wanting but don't see- please ask! We are happy to accommodate special requests when possible. A selection of menu items will be available at the famers market each Saturday but I am happy to take orders for other days as well as long as you give me a few days notice. I do have minimum quantities for non-market days but I am happy to work with you to make your event a special one. Thank you for you orders and patronage and I hope everyone has a great holiday season this year!!! Much love and peace. FALL IS HERE! FALL IS HERE! Or at least some cooler weather and my Fall menu. :) Every week, I choose a selection of the items on my seasonal menu and you are welcome to check in on my weekly flavors (that are constantly changing) and order as much or as little as you like for porch pickup in my neighborhood or at Eleanora's Farmers Market each Saturday morning. If you give me a weeks notice and need larger quantities, I am happy to take special orders for most days of the week. I am also constantly adding new things that sounds yummy- so if you check in on my Facebook page, website (bluebirdbakehouse.com) or Instagram you can find all sorts of things coming out of my oven. Give me a shout if there is anything I can get to baking for you! Spring is coming to an end and Summer is almost here. At the Bakehouse we are still baking up a storm and getting ready for a little summer time fun. Our seasonal Summer menu is making its debut at the farmers market this Saturday but we also take your special requests of any past favorites. If you need to make a special order for your next celebration or corporate event- drop me a line. I am always happy to help! The Easter Menu has arrived! I am thinking cakes for Easter this year. Decorated with birds nests and little eggs, fresh berries, edible flowers.... I am also thinking pavlovas because they reflect the sun shine and blue skies that fill the season. If you want anything that is not on the menu- please ask! I am always making fun quiche flavors, creative breakfast pastries, cookies, cake pops... the list goes on! All orders must be placed by April 8th (or until I am booked) for an April 15th pickup. I can't do pickups on Easter Sunday because I will be enjoying the festivities!